i recently completed a top end rebuild on my raptor. on the clutch side of the head there is a hole in the head that is not threaded. i have a minor oil leak coming out of that hole, and this has never happened before. i looked at pics and the hole is supposed to be there. any ideas as to why its leaking? i sent a pic of where the leak is, i hope it went through. im not seeing it. ive worked on a ton of engines as a mechanic and this one has me totally stumped. I think that there is the drainhole for the sparkplug. Chances are your rocker box cover is leaking oil into your spark plug hole. Don't be embarrassed, you are not the only one :p. Chances are you didn't get enough sealer around the sparkplug hole area. You would think that the spark plug hole would have oil in it. I just checked it and it is dry. I understand if it is a drain hole that it would prevent oil from entering the spark plug hole, but there is absolutely nothing in the hole, not even residue of oil. 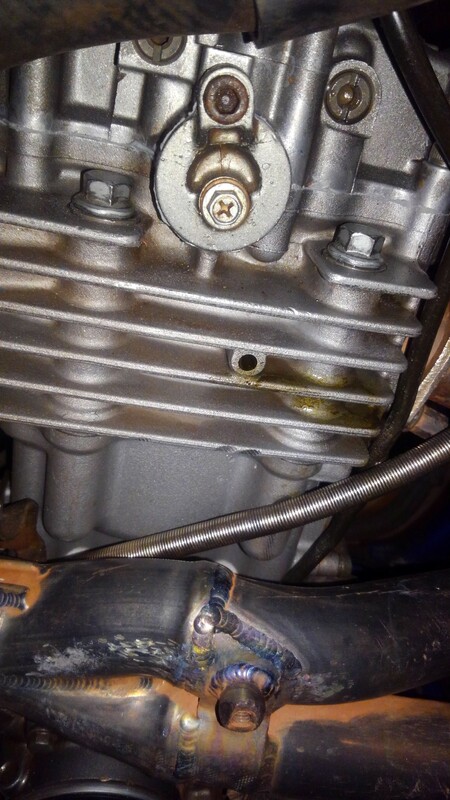 I just looked online at the head with the valve cover off and I can't see any kind of drain hole around where the rocker cover bolts onto the head. Obviously the hole on the side of the head is there for a reason. Digger, I am not doubting your expertise whatsoever. Have you seen this before? If you have i am convinced, and will tear it down. i goggled "raptor 660 oil leak head" and from what i can see digger is right on, not that i had a doubt. in under five minutes i found 4 threads with the exact same issue and solution. give it a try if you still have doubts. Thank you and Digger both I appreciate the advice, I will rip it down and reapply the gasket. What would we do without the internet? Happy roosting up the trails!!!! Its probably a very slow leak. I have heard of this before but never had mine do it. A quick test just to ease your mind would be to dump a little water in there (with the spark plug in of course!) and see where it comes out.